I’d like you to take a minute to consider the possibility of there being a Troll Capitol of the World. I’d like you to ask yourself where such a place might be, and why it might bear such a moniker. While you’re considering that, I’d like you to also imagine the road out of Madison as it winds towards Dubuque. It’s a small highway cutting its way through the farmlands of Wisconsin. About 25 miles out there’s a point where highway 18 splits off from 151, becoming it’s own quiet main street. Before rejoining 151 a mere three miles later, it cuts a straight path through Mt. 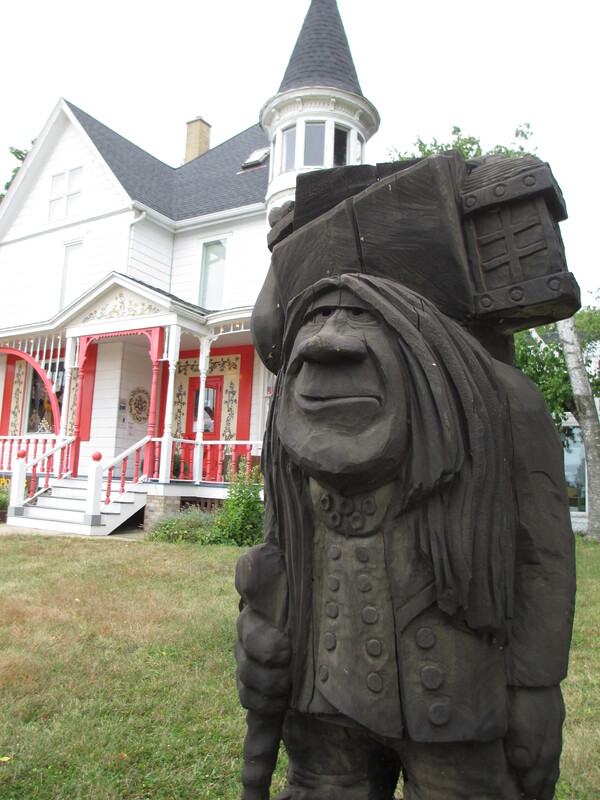 Horeb, Wisconsin: The Troll Capitol of the World. It was late afternoon on a Sunday when I arrived at Mt. Horeb, and the Chamber of Commerce was expectedly closed. I took a picture of the female troll outside the Welcome Center. 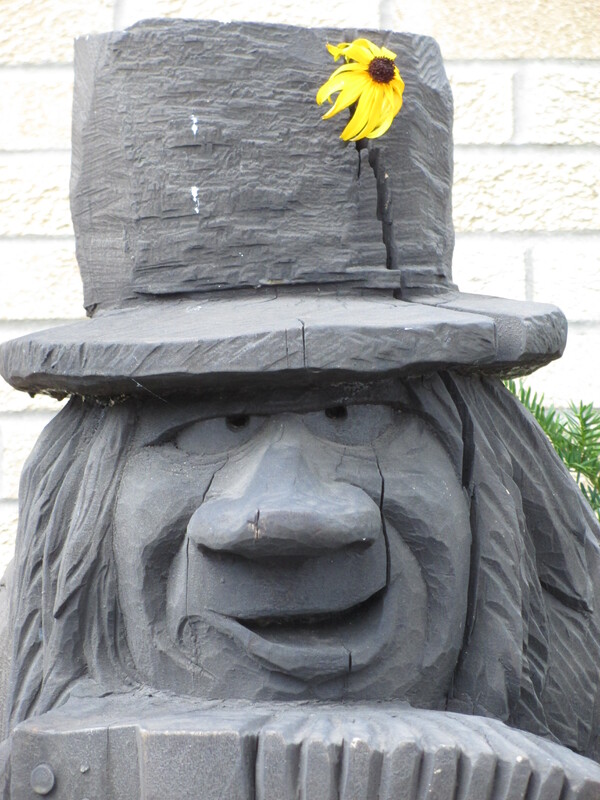 Two doors down I saw what looked to be a couple of shops with wood carvings out front. I took a few pictures of those trolls, too. I walked past the Peddler Troll to get to Open House Imports, the most Scandinavian store I’ve ever seen. There were clogs and viking paraphernalia and tiny figures of women with wreaths of candles on their heads. I saw a shirt that proclaimed “Leif Was First” and four shelves full of specialty beers and ciders. 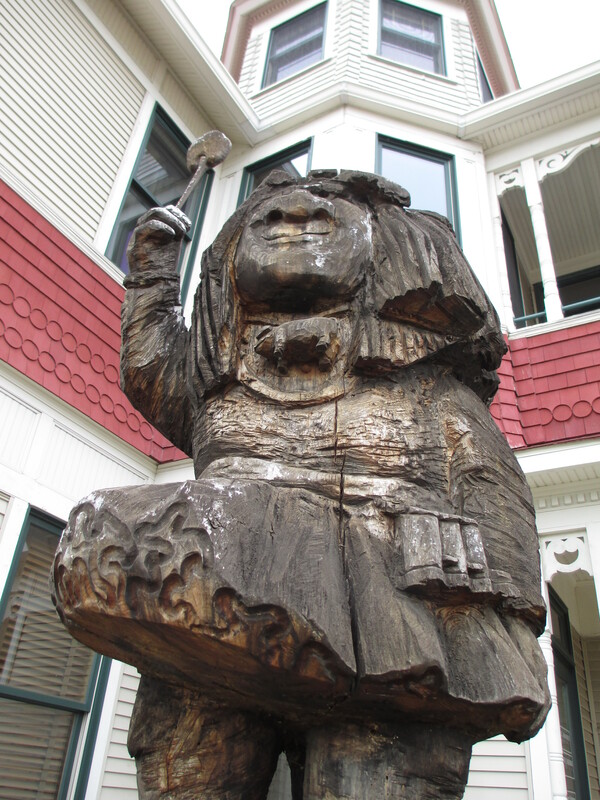 And of course there were the trolls – hundreds and hundreds of stuffed and ceramic and wooden and plastic trolls. I picked up a postcard and stood in silence as the woman behind the counter rang me up. She had already handed me my change and told me to have a nice day when I finally managed to form the most polite version of the question I could. She told me that traditionally trolls protect the farmland, and she gave some coded phrases to indicate that the area might have been settled by Norwegian emigrants. She gave me a magazine called “Southwest Wisconsin Uplands” and showed me the page with the “Trollway” map. The thoroughly not-to-scale map indicated ten official trolls, though I’d already seen several that we not officially marked. I thanked her and set out on my journey of troll discovery. Sometimes I wonder what it’s like to live in one of these towns – one of these towns that has “a thing.” Mt. Horeb has trolls like Roswell has aliens. You see it everywhere. I found a tooth fairy troll in front of the dentist’s office, and a sign in the pub for the 11th Annual Thirty Troll Brew Fest. Does it ever become tiring? As a citizen, do you ever wish you could walk down the street without seeing a smiling but eerie face staring back at you? Do you ever wish you weren’t the Troll Capitol of the World? Such questions go without answers in Mt. Horeb at 5PM on a Sunday. Everything was closed and few people were around. But if you ever find yourself on the way to Dubuque during regular business hours, do me a favor and stop by Mt. Horeb. Ask them if they like their trolls. Who knows, maybe they do. Or if they just keep them around for the sake of the kids, and the crops. Aunt Sally is a bad host. I know this, because she tells me so several times on the phone. I was introduced to Aunt Sally by my friend Sally, who was named after her aunt. Sally and Aunt Sally are very similar people, a fact that they don’t seem to understand and will barely acknowledge. Aunt Sally and Sally are the only reason I bothered with Madison in the first place. Originally I assumed that when I drove through Wisconsin I’d stop in Green Bay, Milwaukee, or possibly Appleton. But Sally insisted that Madison had the absolute best Saturday farmer’s market in the world, and I had to go to it if I could. When I arrive on Friday evening, my bad host Aunt Sally has only bothered to set out a lovely table for two on her back porch, with cherry tomatoes and goat cheese on top of basil and crackers for h’orderves. Dinner is merely homemade chicken salad on a bed of lettuce, with veggie kabobs fresh off the grill. And since nearly every ingredient comes fresh from her garden, she only has one strawberry (which she saves for me). I should have seen this coming. Aunt Sally warned me she was a bad host. Saturday morning we borrow a bicycle from the neighbor (Aunt Sally tracked it down for me the day before) and the two of us take off on the six mile trip to the capitol. We’re on a dedicated bike path almost the entire time, which Aunt Sally tells me is packed at 6AM every weekday from all the people commuting around the lake to get to downtown. Things start to get unusually crowded for a Saturday as we approach our destination. I’ve come to town the same weekend as the Ironman Triathlon. Hundreds of people are swarming around the capitol area in preparation for the event on Sunday. Competitors are doing practice laps in the lake, and we cross over the secured area where hundreds of bikes are to be stored. We park our own bicycles and head to the capitol building. Aunt Sally and I walk the entire loop of the market, which surrounds the deceptively large and classically Jeffersonian structure. Eventually I decide to grab myself a turtle bar from one of the bakery stands, and Aunt Sally picks up an apple and some cheese curds for herself. We sit on the grass at the base of the building to enjoy our lunch. 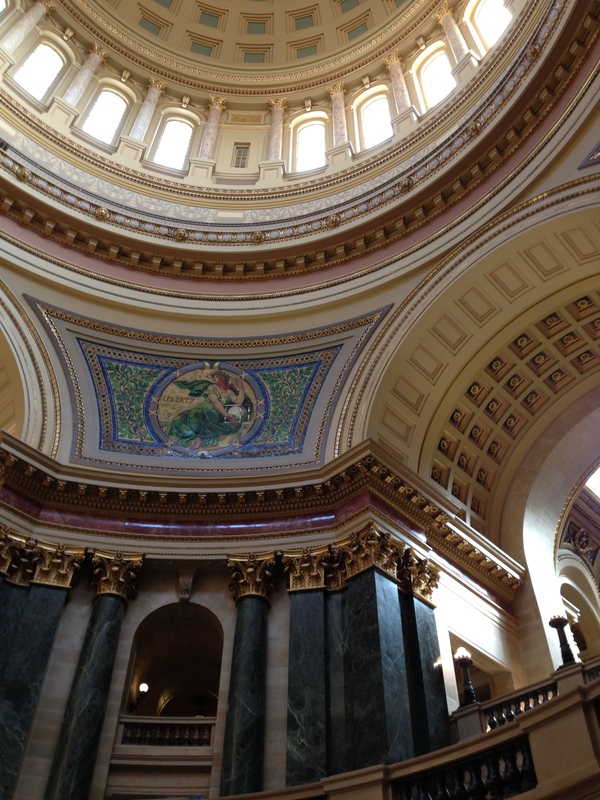 Inside the building, Aunt Sally gives me a crash course in Wisconsin politics. “In this building, you can have a concealed weapon but not a camera.” She starts talking about the protests that happened back in 2011, explaining the backstory. Apparently the people of Wisconsin are unaware that they were front page news for several weeks. When Aunt Sally begins to explain how protestors would sing in the rotunda, I interrupt to let her know I’ve already seen the footage on youtube. She says they still come to sing on most days, though the crowds are understandably smaller. Lately there have been some arrests, including the arrest of a few elderly citizens. Aunt Sally wonders if the arrests will make national news again. Back near the triathlon headquarters, Aunt Sally and I sample the products being peddled at the event booths. We admire the gluten-free, dairy-free energy bars, and get our calves massaged using a pretty sweet muscle roller (which Aunt Sally ends up buying for herself). We pass by the bike holding area, which is now packed with bicycles in waiting. Aunt Sally mentions how expensive professional bikes like these are, and the two of us speculate on how many tens of thousands of dollars are lined up on the racks below. 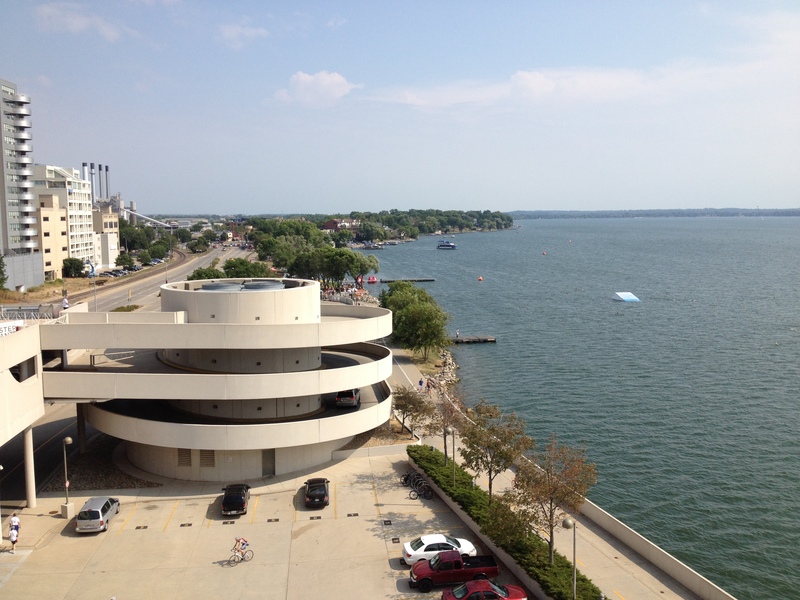 From the Monona Terrace Community and Convention Center (designed by Frank Lloyd Wright), we get a good view of the swimmers out on Lake Monona. Ironman triathletes must complete a 2.4 mile swim, a 112 mile bike ride, and finally a 26.2 mile run. I understand why some people do it, but it’s sure not going on my Bucket List. Worn out from watching other people expend so much energy, Aunt Sally and I stop at a chocolate shop on our ride home. We talk politics a bit more, and she’s amazed when I tell her how in Washington State the legalization of marijuana passed by a wider margin than gay marriage. I tell her that the city of Seattle banned plastic bags at the grocery store, and she couldn’t believe it. “How do you get something like that to happen?” she asks with envy. It seems like Aunt Sally would welcome a plastic bag ban, but can’t fathom an entire city’s citizenry allowing such a thing. We end our day at a fancy pizza place, and Aunt Sally helps me pick a good place to go to church in the morning. We talk more, and I enjoy every minute I spend with Aunt Sally. After all, she’s just like my friend Sally. As I leave the next day I thank Aunt Sally for her hospitality, and tell her I had a wonderful time spending the weekend with her. I don’t think she believes me, but then again, Aunt Sally is a bad host.